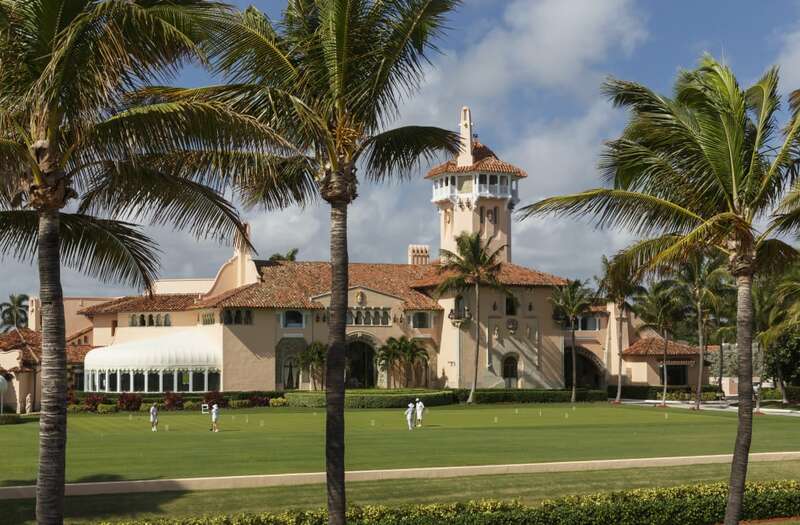 The U.S. government paid $1,092 for an official to stay at Mar-a-Lago during one of President Donald Trump’s trips there in March, according to documents obtained by the advocacy group Property of the People. The National Security Council paid the full rate of $546 per night for the unidentified official’s two-night stay at the so-called “Winter White House” on March 3 and 4, the documents — which the Washington Post reported Friday — showed. About Last Night: Catching up with the one & only Don King! “This is strong evidence of a violation by President Trump of the Domestic Emoluments Clause of the U.S. Constitution,” the group said. Trump placed his businesses in a trust operated by his sons, Donald Trump Jr. and Eric Trump, when he took office, but can apparently withdraw funds and assets from it whenever he wants. That’s led to allegations from critics that Trump is profiting off the presidency, with his properties — including Trump Tower in New York — frequently at the center of those allegations. Mar-a-Lago came under scrutiny shortly after Trump’s inauguration when it was revealed the Palm Beach club had doubled its membership fees from $100,000 in 2016 to $200,000 in 2017. Then, in April, the State Department took heat for effectively promoting the president’s resort on its websites. General view of the upper balcony area during Donald Trump Jr. and Vanessa Haydon's wedding at The Mar-a-Lago Club November 11, 2005 in Palm Beach, Florida. View of the beach club pool at the Mar-a-Lago estate, Palm Beach, Florida, February 17, 2003. General view inside The Mar-a-Lago Club November 12, 2005 in Palm Beach, Florida. American businessman Donald Trump talks with a group of Boy Scouts on a tour of the Mar-a-Lago estate, Palm Beach, Florida, 1999. General view of the upper balcony area at The Mar-a-Lago Club November 12, 2005 in Palm Beach, Florida. General view of Donald Trump Jr. and Vanessa Haydon's wedding reception at The Mar-a-Lago Club November 12, 2005 in Palm Beach, Florida. An American flag flies over Donald Trump's Mar-A-Lago club November 1, 2006 in Palm Beach, Florida. The town of Palm Beach has cited Donald Trump because the flag is too big and does not meet the town's specifications. A hearing is scheduled. (Original Caption) Marjorie Merriweather Post Hutton's home in Palm Beach, Florida. Trump has also been chastised for his frequent, taxpayer-funded trips to the resort, where he’s hosted Chinese President Xi Jinping and Japanese Prime Minister Shinzo Abe. During the latter’s visit, Mar-a-Lago members had a front-row seat as Trump and his Japanese counterpart dealt with a North Korean missile test in the club’s members-only dining area. The Trump administration on Friday released the names of 22 people related to Abe’s February visit, but refused to provide ethics watchdogs with the full visitor logs they’d requested via the Freedom of Information Act. CREW and other groups in April filed a lawsuit against the government requesting the resort’s visitor logs after the Department of Homeland Security refused to respond to FOIA requests. A judge ruled in the plaintiffs’ favor this summer, ordering the administration to provide all Mar-a-Lago records from Jan. 20, 2017, to March 8, 2017. In a statement Friday, CREW executive director Noah Bookbinder said the organization “vehemently” disagreed with the government’s position and vowed to fight the administration again in court.